For the sake of a better review, I have written two different reviews of Megatokyo. 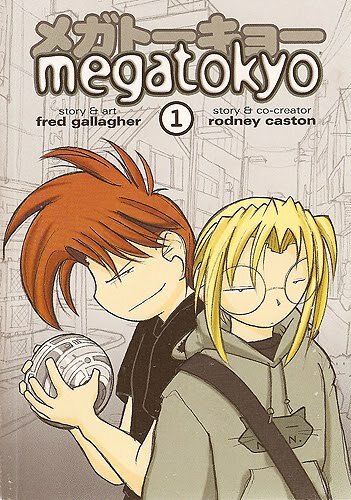 This one reviews the span of early comics in which Rodney Caston was the co-writer of Megatokyo. The other follows the time period after Piro and Largo split up, leaving all art, plot, and humor to Fred. Megatokyo begins as a typical webcomic. Here you have your lazy and drunk gamer who speaks in l33t, your wimpy otaku, and a bunch of insane Japanese cultural points and things like anime and games to be the blunt of the jokes. However, the series works well with what it is given, and creates a quite enjoyable webcomic from it. While the plot may seem rather cliched for a webcomic, the writers pull off gaming jokes that you expect Tycho and Gabe would have done to death really well. You can practically see the clashing ideas of Fred and Rodney as their characters go through their crazy adventures. Largo does or says something stupid, while Piro acts as his foil and makes us laugh at it. Occasionally, the roles are switched, but the jokes generally stay in predictable territory. Even though the jokes never go beyond any realms we haven't seen before, their delivery and inside perspective make this a joy for otaku and gamers. Of course, as the comic progresses, we begin to find mor original comics. Instead of following the story all of the time, we are treated to random (and often comical) looks into the lives of the writers. In addition, things like a rather amusing Penny Arcade parody sneak in there as well. Then, of course, there is "Shirt Guy Dom." Dom Nguyen is a friend of Piro and Largo who helps out with Megatokyo and occasionally...draws stick comics with a trackball when Piro can't draw something that day. While Fred, Rodney, the general readership, and even Dom himself considers these to be the most powerful image of evil in the universe, these comics are undoubtedly some of the funniest in all of Megatokyo. Dom simply writes about events in his life, but his blatant self-parody makes the horrible artwork that much more amusing. As for art, there is a single major difference in Megatokyo from most other webcomics. Fred draws his comics in pencil, traces them in pencil, and then scans them into the computer where he fixes them up. So, his final drawings end up as pencil drawings, a quite unusual approach for a comic. Nevertheless, his art has a very clear and expressive style. In addition, his experience as an architect allows for him to create very realistic-looking buildings and such. The panel layout begins with a simple yet effective 4-panel square layout, but moves to a harder-to-read, but more expressive manga one later on. Fred creates a pseudo-manga that does not look like an imitation. The influence is there, but almost never overwhelms the reader. There are some problems with his art, though. As good as he is with architecture, Gallagher still has trouble with human anatomy and facial structure. Luckily, his skills progress quickly throughout the comic. Megatokyo is a very simple webcomic at the "Largo Era" stage. Piro's art is gaining skill, while the two work together well to make jokes that are both absurd and clever. This can make mainstream viewers laugh, while true nerds will find the workings of Piro and Largo's world to be even funnier. Megatokyo volumes 1 and 2 are a great buy for fans of webcomics, and extras like commentary on the bottoms of all of the 4-panel strips make it even more enjoyable.